Everyone who contemplates weight loss surgery hopes that their weight loss struggles will end. For many people, the struggle continues and some will gain all of their weight back. There is not one cause of weight gain, but many that contribute. Below are the top 6 causes of weight gain after weight loss surgery. In the 10+years I have spent as a bariatric dietitian I have had more patients than I can count come into my office or call me because years after their weight loss surgery they are gaining weight. Often patients are surprised and think that there is something wrong with their stomach/surgery. Most of the time (99.9%) there is nothing anatomically wrong with the patient. What is wrong is that they have returned to their old habits. I hear many patients say “after the surgery, I did x,y, and z”. “I used to” is a common phrase used. Now they don’t do those things. Maybe they used to make sure they drank enough water, now they don’t. Maybe they made sure they ate three meals a day, but now they skip meals. I find that patients are very diligent after the surgery for fear of getting sick or “messing up” the surgery. As years go by, patients find that they feel normal and they don’t get sick. Diligence fades away and not so good habits creep in. 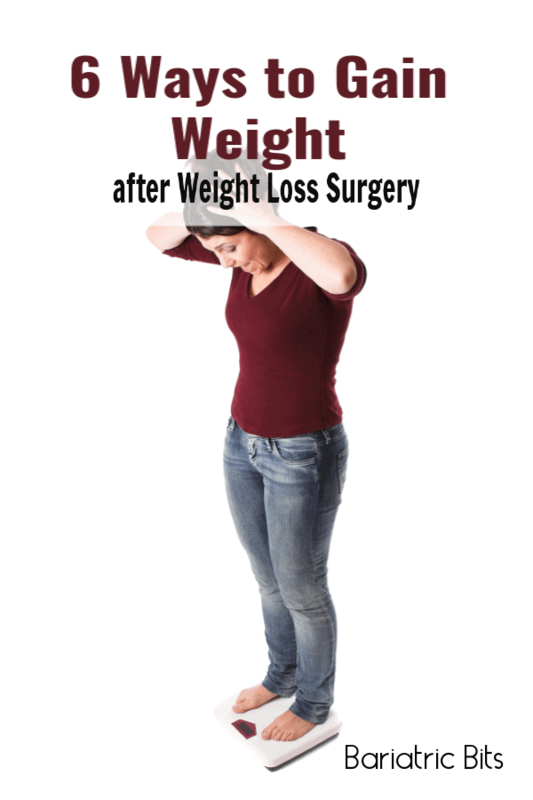 Weight loss surgery patients who gain weight generally are not doing one thing wrong. There are usually multiple factors. Skipping meals: when you skip a meal you miss out on the calories and nutrients your body needs at that time of day. You physically cannot eat more at your next meal like you may have done prior to surgery. Eating less and fewer calories will not help you lose more weight. You will actually stop losing weight and decrease your metabolism. A lower metabolism at some point in time will equal weight gain. The longer you go without eating the hungrier you will become. Hunger leads to overeating and/or poor food choices. Snacking on junk foods: A lot of my patients crave salty and crunchy foods. My theory is that (1) many postoperative meals consist of softer foods and you simply want to bite down and hear that crunch of a pretzel or chip. (2) with a better eating pattern, many patients have very low sodium diets. This is great, however, for some, their bodies are trying to tell them, “hey I need some salt in here!” Another issue is that snack foods are easy to tolerate. Food that crumbles or melts won’t take up a lot of room in your small stomach, which makes them easy to eat and easy to overeat. The problem though is that the snacking becomes more frequent and causes healthy foods to decrease in the diet. More food is being consumed that is not of great nutritional value. Drinking calories: liquids do not fill you up as food does. Beverages that contain calories will add up and can easily create excesses that lead to weight gain. Not exercising: weight loss is said to be approximately 80% diet and 20% physical activity. Even though the percentage is low, exercise is important to weight loss and to weight maintenance. In my experience exercise becomes more important in the maintenance phase then the losing phase. Exercise builds muscle which is metabolically active. This means that the more muscle you have the more calories you burn at rest. Basically, your metabolism becomes more efficient. Unbalanced meals – eating too many carbohydrates and not enough protein. The optimal composition of a meal for satiety is protein, carbohydrates, and healthy fats. This combination increases your level of fullness and leaves you fuller longer. Once you lose weight following your surgery your journey does not end. You need to continue to be mindful by monitoring what you eat, how much you weigh, and how you exercise. Weight loss surgery is just a tool. Surgery will only get you so far. It’s up to you to use that tool wisely. I had a gastric sleeve done 5 years ago and know I’m have stretched my stomach – I have regained 22kg of the 37kg I lost and am getting more and more depressed. Is it possible to have another sleeve surgery or does the fact that my stomach has stretched mean the stomach is now too thin? Hi Judy, So sorry to hear that your weight loss hasn’t been what you expected. I would reach out to your surgeon in order to have your sleeve evaluated. You can then discuss your next step. The surgeon’s I have worked for would not do another sleeve, but generally convert to a bypass is possible. My question is how would know if stretched your stomach? Your surgeon would like do some test to see if your pouch has enlarged. Hi Angela! I think with the right food choices and proper exercise (cardio with resistance training) you can lose weight. Weight loss is 80% diet, so I would first examine your eating and see how you can improve it. Focus on protein and plants (fruit/veggies).